In July we shared how, over the past few years, we have purposefully been transforming ABIM boards and committees. These boards and committees are full of passionate, hardworking members who have gone through a rigorous selection process. 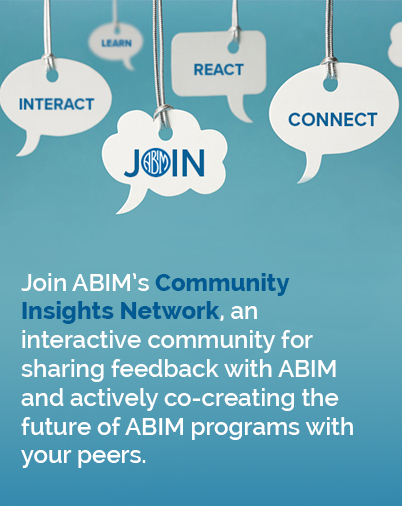 Each member brings a unique perspective and their own story for why they want to make a difference in the greater medical community through service to ABIM. Each month, we will feature one of our members in a ‘Why I Serve’ post, which we hope will give you a greater appreciation for their work and the insight into what we are learning and accomplishing together. I have been a board certified hematologist and medical oncologist in community practice for nearly 30 years. I still recall the thrill of receiving my initial certification in Internal Medicine and subsequently those in Hematology and Medical Oncology. It was as if the signatures of the luminaries on my certificates were personally validating my entry into my chosen profession. I was old enough to have been “grandfathered” as part of the initial rollout of Maintenance of Certification (MOC) which, at that time, quite frankly, was just fine by me. In 2008, I was invited to join ABIM’s Medical Oncology Board Exam Committee specifically as a representative of those of us in the community to help assess the relevance of questions to the practicing physician. However, despite being “grandfathered,” it was required that I pass the Medical Oncology MOC exam before being able to participate on the committee. It was that experience that convinced me, more than any other, of the value of MOC. The preparation was a means of demonstrating ongoing competence and an opportunity to do a deep dive into the evolving science of my chosen profession, both for my own education as well as for the optimization of care of my patients. As a result, I subsequently went on to voluntarily take the Hematology MOC exam as well. Is the long-form MOC exam the right way to do this? Perhaps for some, but clearly not for others. My tenure on the exam committee has come to an end, but I am now a member of a newly reconstituted Board of Directors of ABIM, where changes to the process are happening. There is a recognition that missteps have been made in the past but there are ongoing efforts within ABIM, in concert with thousands of physicians and several specialty societies, to roll out a process of MOC in which all diplomates will see value. I still proudly display those initial certificates not just because of what they meant to me as a validation of my ability to independently practice, but because they signaled an entry into a profession in which physician-driven standard setting is the norm and expectation. Times have evolved and ABIM is committed to changing with them. There are, however, others who would repudiate the whole process of MOC during this time of ABIM’s evolution. I believe this is short-sighted and will undercut the very standard setting that makes us unique as a profession. In fact, ABIM has already made changes to its program based upon physician input and feedback. But most importantly, our patients have given us their trust. On a daily basis, they expose themselves to us both physically and emotionally. We, in turn, owe them a process that rigorously demonstrates our ongoing competence, commitment to lifelong learning, and the fact that we have kept up with our ever-evolving and wonderful profession.